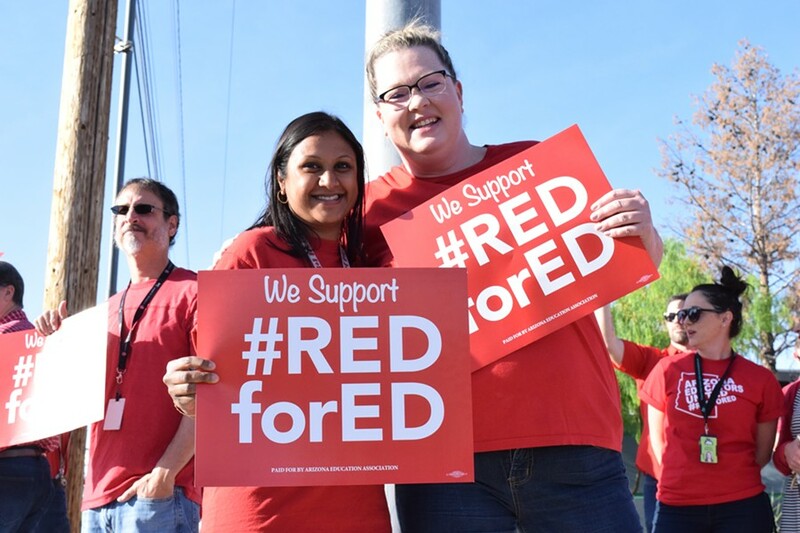 Along with many Tucson schools, educators at Amphitheater High School hold a Red for Ed walk-in before school on April 11. Educators’ strike will start on Thursday, April 26, across Arizona, according to leaders in the Red for Ed movement. Votes from all public school teachers and classified staff who chose to participate were tallied last night. Arizona Educators United and Arizona Education Association said they counted more than 50,000 ballots and about 78 percent voted to strike. Marea Jenness, a Tucson High Magnet School teacher and leader in the Red for Ed movement, said she’s excited about the vote. “This is just the opportunity of a lifetime, to fight for our schools and public education in Arizona,” she said. The Red for Ed movement, led by the grassroot group Arizona Educators United, or AEU, has been pressuring Gov. Doug Ducey and the state legislature for weeks to give teachers 20 percent raises, among other things. Arizona educators are currently among the lowest paid in the country. And in response to mounting pressure, Ducey agreed last week to provide 20 percent raises for teachers over a three-year period as well as some additional education funding, but that did not meet all of AEU’s demands. Apart from the 20 percent raises for teachers, educators are demanding wage increases for all education support staff that’s competitive with other states, scheduled annual raises for teachers, education funding restored to 2008 levels, and no new tax cuts until per-pupil spending reaches the national average. Jenness organized one of the first local Red for Ed rallies, which resulted in more than 1,000 educators and allies marching out of their downtown schools earlier this month. She said Tucson High is going to have minimal staff during the strike, mostly administrators and some custodians and cafeteria staff, to make sure the students still get breakfast and lunch. She also said there will be limited bus service. Another complication of strikes is that any day of school closure will have to be made up in order for students to complete grade requirements. Therefore, students who are ready to graduate will still need to complete days they miss. The Marana Unified School District put out a statement yesterday, signed by MUSD Superintendent Doug Wilson, that said the district hopes such extreme measures as a strike will not be needed. MUSD said the schools will stay open as long as they have enough staff to supervise students. But if they don’t, they will be forced to close, a measure that would be district wide rather than school by school. The Amphitheater Public Schools district also sent out a letter saying they may be forced to close schools if there are not enough staff to adequately supervise the children. But Amphi will look at school closure on a case by case basis rather than district wide. Catalina Foothills Unified District also said they may have to close schools if there’s not enough staff to supervise students.